BUT, Houston we have a problem. All clients want Instagram for their Influencer Marketing Campaigns and Instagram is arguably the least friendly platform for marketers to use when conducting Influencer Discovery and Research. Which is why we built SocialCaddy, an Instant Influencer Analyzer. 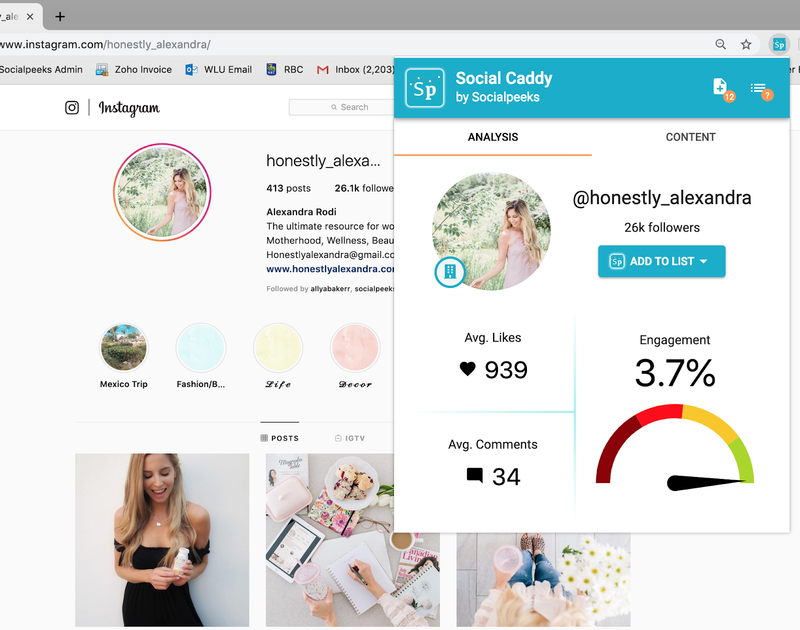 SocialCaddy is a FREE Chrome Plugin that you can use anytime you are looking at Instagram (in your Chrome browser) and gives you the information you need to know about that account and if you would like to collaborate. First, download SocialCaddy from the Chrome Store. Next, visit any Instagram account using your Chrome Browser. Click the SocialCaddy icon in your Chrome browser bar. When you first launch SocialCaddy, it analyzes the last 12 Instagram Posts from that Instagram account. So we added the “Add Post Button”. Allow you to search further back in the account's timeline to identify Top Posts or previous sponsored collaborations. By now you are probably asking yourself a couple of questions: What mad geniuses made SocialCaddy (Answer: Canadians) AND once I identify a potential social collaborator/influencer NOW what? Well, I'm glad you asked. SocialCaddy allows you to save any Instagram account to an Influencer List. Click the “Add to List” button and save that Instagram Account in a list for later review. You can even share your Influencer List with colleagues and clients for their review and approval. Pretty awesome EH! (Sorry, but we are Canadian). You can create any number of lists for your campaigns and projects. But wait, there’s even MORE! When you are surfing Instagram and doing Influencer Research, accounts can begin to look the same (even the beautiful people). You can easily forget the account names or mix up people after hours of Instagram surfing. Well, buckle up because we have some great news. Once you’ve added someone to a SocialCaddy list, it automatically adds a little Tag, showing that this account has already been saved. Should you stumble across that account again, you will now know you have them saved on one of your SocialCaddy lists. You can click the Saved tag to go directly into that list and view their account analysis. You will now never save the same influencer twice. You now have the ultimate Instagram helper for your Influencer search and management. Visit the Chrome Store and download the free SocialCaddy Plugin and get started. Please leave us a review and email info@socialpeeks.com if you have any questions, feedback or just want to thank us personally (feel free to buy us a beer if you ever visit Canada).